I'm here to help you along your path. Offering psychic guidance, spiritual counseling and workshops to help you along your spiritual path. All of Life is energy. As an intuitive and energetic sensitive, Rev. John can help you navigate the murky waters you may currently be facing with intuitive insight and spiritual know-how. Parties are a fun way to share the gift of psychic guidance with your friends and family! Host a party for eight or more and get a FREE reading. Please be aware of my Cancellation Policy. Pay for your Reading Online! 7 people or less = 60$ per person. 8 people or more = 50$ per person. Hostess gets a FREE reading. Saturday-Sunday, please note* start times are encouraged to be noon for larger groups. (Lead time for weekday parties is usually several weeks, lead time for weekend parties can be several months.) $25 per hour travel time charged outside the greater Youngstown area. Join me at the Harmonic Journeys Holistic Fair in Rocky River, OH! I will be in the main vendor's room, not the reader's room, stop by for a reading! "John is a master at giving very clear, very useful psychic guidance." I was so delighted and impressed by his ability to assess what I needed so quickly. I recommend him wholeheartedly. "Thank you John for an exciting evening of psychic and medical intuitive readings for my angel sisters"
The accuracy and presentation of John's reading was amazing! 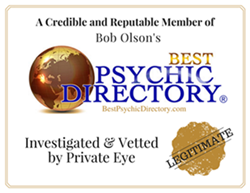 I highly recommend John for your next psychic reading either personally or for an evening with friends and family as we did! "John's precision was nothing short of amazing." John had felt that there was indeed water on our property. We called and asked him to come out to our land and see if he could help us find a source of water. (He)first used a pendulum with a map of the property to narrow things down, then walked the entire property using is abilities to locate sources of water.